A blind trust is a financial trust in which the executors have full discretion over the assets, and the trust beneficiaries have no knowledge of the holdings of the trust. In this case, our Blind Trust is a wine in which the winemaker has full discretion over the blend so you’ll just have to trust us. The Blind Trust is the second label of our big Bordeaux style blends, and its robust taste profile and affordable pricing make it a solid investment.This big red shows a nice balance between fresh andearthy, rounded with baked cherry and prune plum fruit flavours. 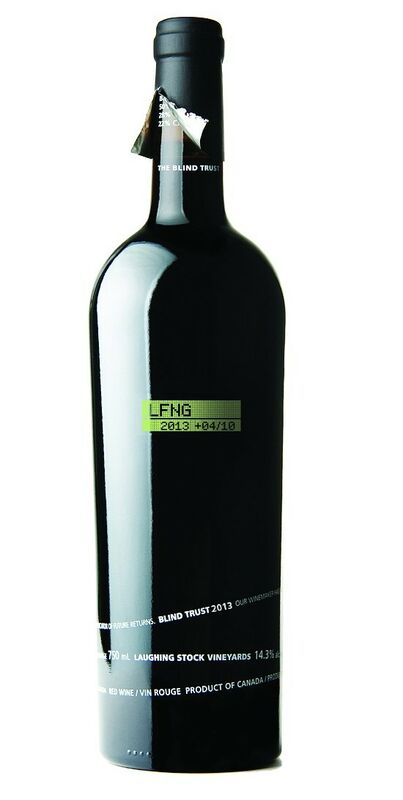 Darker notes of dark chocolate and warm leather on the palate, with a smooth, long finish. Grapes are handpicked and hand sorted both by cluster and berry upon arrival at the winery. Fermentation is done mainly in stainless steel but David is also using oak fermenters and extended maceration on some lots. Since the barrels for Portfolio and Blind Trust are treated exactly the same for the first 15 months, the selection process is a lot like asking which of your children you like the best. Tough decisions indeed, especially when each vintage has 150 barrels with 5 varietals from a dozen vineyard blocks. If you want to blind taste the Blind Trust, read no further. Sauvignon, and 9% Cabernet Franc. In 2013, we were again blessed by Mother Nature with a warm growing season. However, every year always brings its challenges and while we had solid heat units through the summer months, it also brought some humidity which is unusual for the Okanagan. For reds, mildew pressure was higher than normal, but with prudent farming strategies, our vineyards were not affected. It can be tempting in a good growing year to leave extra crop on the vines, but our approach is to be conservative and crop the vineyard lightly to deal with the unpredictability of weather. Fortunately, after some rains in September, the weather dried up through October which allowed us to pick on schedule at optimal ripeness levels.